In this familiar passage you will note how the angels first appeared to the Shepherds in the fields surrounding Bethlehem, the House of Bread. 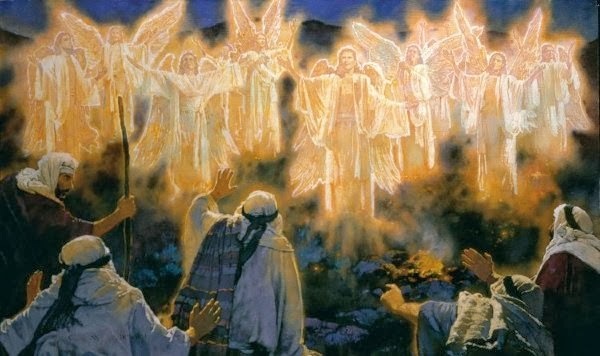 At first they feared the sight but were quickly calmed by the words of the angel who told them he had come to bring words of great joy! With haste, the shepherds go to Bethlehem to view the birth of the Lord Jesus Christ. The story is one Christians have become accustomed to reading during the Christmas season. But what I find interesting to note in the story is the last couple of lines in the passage, "Now when they had seen Him, they made widely known the saying which was told them concerning this Child. And all those who heard it marveled at those things which were told them by the shepherds." When one hears good news they want to spread it. In this case it was a well known fact that daily the people of Israel were waiting for the Messiah to appear. So this news came as a refreshing like cool water on a hot day to the ears of all who heard. According to the Bible the answer to this emptiness is to be reconciled with the Creator. We Christians are then called, like the shepherds, to share the news of Christ's appearing to all people. It is God who pleads through us to those whom we speak to bring the message of reconciliation. Reconciliation is what occurs when a breach in something, such as a contract, has been repaired. But we are not left in the cold to take this message to all without His help; for there is one sure thing we can know about all people and that is that they instinctively know they have done things that, according to the Bible, are acts of sin; the Holy Spirit bearing witness. These actions clearly place all of us in a position that is opposed to Christ who lived a sinless life. We can do one of two things with the knowledge of who we know we really are, sinners. For one, we can hide from it--sweep it under a rug an pretend it does not exist, or two, we can seek a way for it to not be of any significance to God any longer. Because of the knowledge of sin's presence within us we find the answer to our hope of expiation when we realize their is a way for it to be exonerated. Righteousness, another heavenly word, means to be pure and without sin--without spot and blemish. Jesus was righteous and lived righteously. At one time He had spoken to the Jewish crowds of their religious leaders in the following way, "For I say to you, that unless your righteousness exceeds the righteousness of the scribes and Pharisees, you will by no means enter the kingdom of heaven." (Matthew 5:20) These are hard words because the Religious leaders, at least outwardly did "good" things and lived clean lives. Surely of all people, they should be accepted by God into heaven for their "good" works sake. But Jesus said no, their righteousness was just not good enough; it must exceed the "goodness" of the "good." That is where reconciliation as the answer comes in. Like the religious leaders, our "goodness" is not "good" enough. Jesus was not just giving His opinion on how to get to heaven, He, as God in the flesh, the Creator of the world, made this authoritative statement that condemns us where we stand. It is clear in the passage that faith in the Lord Jesus Christ, the one who makes the unjust person just, is all we need. Our works--our goodness does not cut it. But the work of God in Christ does. The news the shepherds took to the people of Bethlehem, Jerusalem and many points in between was that a Savior had been born wrapped in swaddling cloths and lying in a manger. They immediately knew the significance of the angelic announcement. The sheep destined for the sacrificial system in the area from Jerusalem to Bethlehem were always wrapped in swaddling cloths. Jesus would be the sacrifice that would take away the sins of the world. He was the Passover Lamb to whom all people thenceforth, from the time of His crucifixion, would bow before in humble submission, confessing their sins in order to receive the forgiveness He offered. This action is how God reconciled the world to Himself through Christ. That was good news and it is still the greatest news on earth. It is the Announcement that continues to be announced. Jesus, the Savior has come! The fountain of life flows freely to all who will believe and trust in Christ as Savior and Lord of our Lives. May you have the Merriest of Christmas' and thank God for sending the angels to announce that the Savior has been born!